The City of Gardens - Outdoor Activities in Victoria, B.C. Besides being the Crown Jewel of British Columbia, Victoria is also known as the City of Gardens, and for a good reason. With one of the most temperate climates in Canada, Victoria has plenty of plants that thrive. Their beauty is seen in the hundreds of personal and public gardens that tourists and locals enjoy spending time in. Some can be visited all year round. 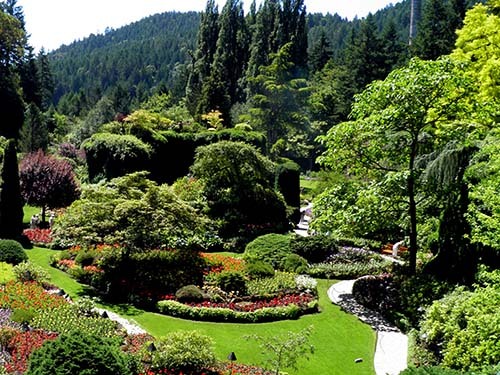 Most people have heard of the famous Butchart Gardens, but there are many other garden treasures in the beautiful British Columbia capital city. Check out some featured gardens below! Finding its 1900s beginnings as a humble limestone quarry, the Butchart Gradens thrived under the green thumb of Jennie Butchart. Although they struggled after her death, the gardens were reborn in 1946 with the arrival of Jennie’s grandson, Ian Ross, and his wife, Ann Lee. It is now one of the top garden attractions in Canada. Under the Butchart Family name, the gardens have continued to grow. Today, 55-acres contain the original quarry, known as the Sunken Garden, a magnificent rose garden and popular Japanese, Italian and Mediterranean gardens. More than just a place for looking at plants, the area also contains cafes, fountains, totem poles, restaurants and even a carousel! Featuring many different and beautiful displays depending on the season, plus a concert and firework lawn, the Butchart Gardens are an ever-chjanging experience. It’s an attraction worth visiting any time of the year. In fact, the gardens are consistently listed under many TOP THINGS TO DO in Victoria lists, and shouldn’t be missed! The Abkhazi Garden has both a unique history and design that makes the heritage home, teahouse and garden a popular spot to visit. Not only does its location create an escape from the city, it possesses a dramatic and natural landscape. It features glacial rocky outcrops, incredible Garry oaks, and a secluded teahouse. The teahouse itself is a beautiful display of West Coast design. As a romantic twist, historically, the Abkhazi Garden is the child of Prince and Princess Abkhazi, war-torn lovers of WWII. The garden came to be in 1946 after they were finally reunited in Victoria. The couple grew the fantastic west coast features of the garden together for almost forty years until their deaths. After, it was purchased by the Land Conservancy. Today, it is well-loved by both tourists and Victoria locals, especially for tea time! With its University of Victoria location, the Finnerty Gardens see plenty of visitors including students, professors, tourists and other locals. The 6.5-acre plot is tended by a group known as the Finnerty Garden Friends, UVIc Alumni and community members. Visitors will find over 200 species of rhododendrons (some of them over 6m tall! ), thousands of azaleas and over 4,000 different trees and shrubs in the gardens. Through careful planning and development, the paths, ponds and inviting benches provide rich diversity in scent, colour and display all year round. The best time to visit for the rhododendrons is in May. However, the ever-changing gardens are a treat at any time of the year. Pair the garden visit with a tour of the University of Victoria campus, or check out the nearby boutiques and beach of Cadboro Bay to enjoy a well-rounded day in the area. Hatley Park is most famous for its castle and nearby estate gardens, but there is much more to the property than those already stunning features. In fact, there is over 560 acres of area to stroll through, including old-growth forest, ocean view walk ways and the Royal Roads Botanical Garden. The estate gardens are some of the oldest original Edwardian Estate gardens in all of Canada, established in 1912 when James and Laura Dunsmuir hired a firm to create a plan for their newly built castle grounds. They came up with a series of garden rooms that laced their way through the area, including a traditional Rose Garden, Japanese Garden and Italian Garden. All three are available to visit, and each offers its own unique and stunning display of horticulture, which James Dusmuir was very fond of. Lanterns, stone-lined walkways and plenty of moving water greets you across the small arched bridge of the Japanese Garden. It’s a place of tranquility, offering a deep breath of fresh air. The Rose Garden features blossoms from nearly every inch of available space: entire archways, towering posts and bushes lining the ground. Every colour, size, type and style of rose can be found inside. Then there are the Italian Gardens, which take you straight back to the renaissance. Stonework covered with classical flowers and colours creates shelter and a refined sense of peace. This garden reflects of loves of Laura Dunsmuir: colour and drama in how the blossoms unfold and blend into the beautiful garden. 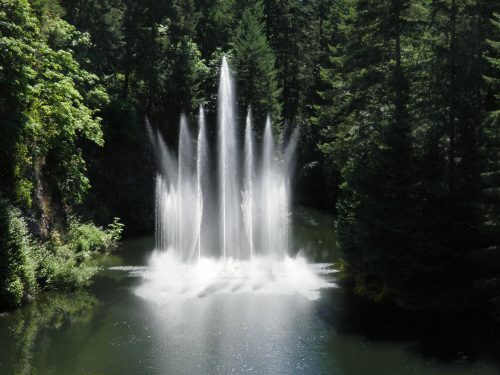 Give yourself a couple hours to truly enjoy the Hatley Castle and its stunning heritage park lands. The dramatic stone castle, familiar thanks to its role in the X-Men movie, is backed by a whimsical setting of ocean and lagoon vistas with towering mountains on the horizon. The Horticulture Centre of the Pacific (HCP) is both a giant garden and teaching center. The not-for-profit has the goal of creating not only a recognized botanical garden, but also a place of conversation, research and learning. Spanning 44-hectares of land, the vision is steadily making its way towards being a reality. The Conservation Park covers 100 acres, and it is free to the public. It has many cycling trails, bird watching platforms and second-growth Douglas firs that surround the wetland trails. The Outerbridge Park is a wildlife and bird sanctuary. The many other gardens include the 3 B’s Garden (birds, bees and butterflies), and Takata Japanese/Zen, Bonsai and Mediterranean gardens. They even boast a Farm Garden, where visitors and technicians learn different gardening techniques for year-round growth of your own fruits and veggies! The latest installment at the HCP is a Golden Spruce – relative to the one and the same famous tree that was hacked down in its Haida Gwaii home. While this particular spruce lacks the hormone needed to grow into your traditional, triangle tree, it is the oldest direct descendent of the original, historical tree, having been grafted from a lower branch. To see HCP in its entirety and take full advantage of their amazing workshops, more than a few visits are in order. However, it is well worth the time. The HCP is both an educational and beautiful outing. A famous Victoria trademark since 1937, the hanging flower baskets that adorn Victoria’s downtown lampposts from June to September signify the beginning of summer. They also add even more colour to the already bright waterfront city core. The beautiful sun baskets, as they are called, each possess a total of 25 plants and include 9 different varieties. Carefully designed for the warmer temperatures and to bloom until early September, these local, nursery grown plants fill about 1,360 baskets that are constructed over four weeks. The arrangements are hard to miss. They are yet another display of the beautiful plant life the mild climate of Vancouver Island affords. Plus, they bring a smile to the faces of all those in the area. For a splash of colour and joy while visiting the Oak Bay area of Victoria, B.C., pay a visit to the small, but beautiful Lokier Gardens. The garden’s name sake, Thomas Lokier, was a much admired resident of Oak Bay, whose home overlooked what was originally a small lot selected for a war memorial. When the memorial ended up being placed at Cattle Point, it went to ruin and became a weed-filled area. Rather than let the area’s state of disrepair continue, Mr. Lokier developed a rose garden, providing funding for plants and fencing, even designing and building the park’s iron gates himself at age 83! The park was officially dedicated to Thomas Lokier in 1963 for his 95th birthday, and he passed away six years later at 101 years of age. Today, the welcoming benches and charming green space beckon visitors to take time to literally smell the roses. It offers a spot of fresh air and tranquility within Victoria and Oak Bay. 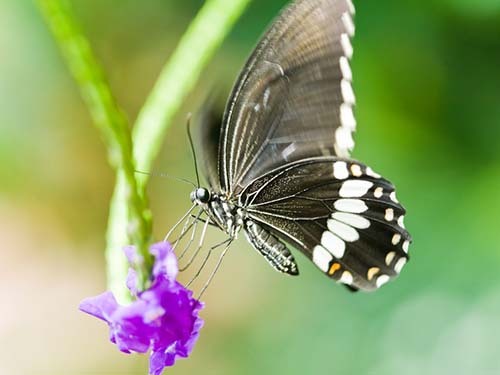 If you’re already planning to visit the Butchart Gardens, then the Butterfly Gardens are a must see along the way. Just five minutes from their famous neighbor, this 12,000sqft enclosure is a tropical jungle. 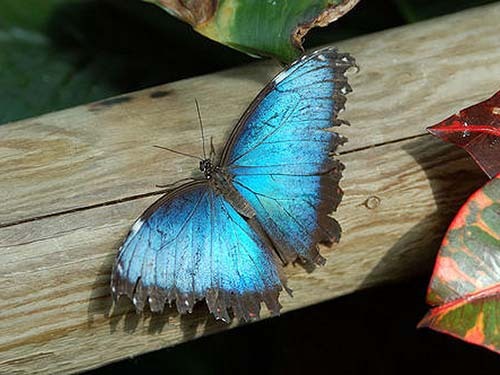 It is home to thousands of free-to-fly butterflies, as well as various amphibians (and a chameleon! ), tropical birds and flamingoes, tortoises and turtles, and giant koi. Enjoy hundreds of blooming tropical plants and watch the carnivorous plants feed in the carnivorous plant display. For something a little different from the traditional gardens in Victoria, the Butterfly Gardens are a great spot. Many of Victoria’s parks also feature amazing plants and well-kept gardens within. Be sure to check out our Parks page to find more hidden gems.